The FRITZ!Box automatically connects to the internet (operation as a DSL router) when you connect it to your DSL line and enter your personal account information in the FRITZ!Box user interface. All of the computers, smartphones, and other devices connected to the FRITZ!Box can then use the internet connection at the same time and have equal status. Connect the FRITZ!Box with the DSL line. You will find detailed instructions on the installation poster included with the FRITZ!Box and in the manual. Enter the FRITZ!Box password on the underside of the device and click "Log In". 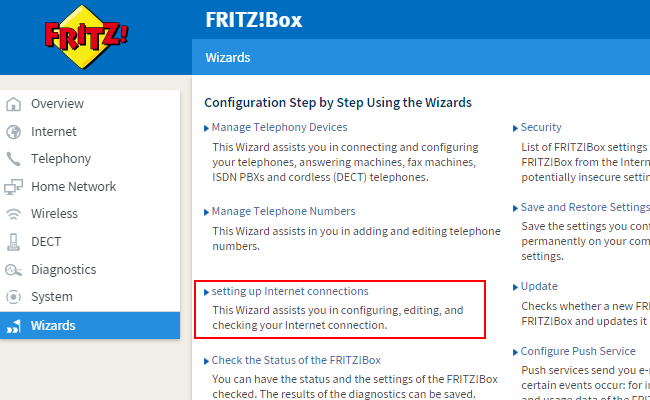 If the wizard for internet access does not start automatically, click "Wizards" and then "Configure Internet Connection". If your internet service provider is displayed in the drop-down list, select your internet service provider. With some regional settings, not all of the preconfigured providers are displayed until you select "More internet service providers". If your internet service provider is not displayed in the drop-down list, select the entry "Other internet service provider". Click "Next" and follow the wizard's instructions. Now the FRITZ!Box uses the account information you entered to establish the internet connection. Configuration is completed when the message "The internet connection check was successful" is displayed.